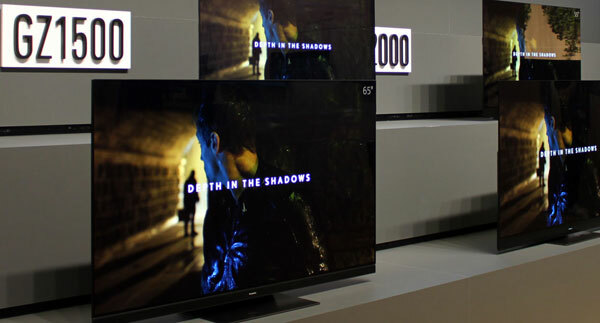 Sony had prepared shootouts and additional demonstrations of its new flagship TVs with the intention of showing how well they compare to the studio reference. Here are our hands-on impressions of Sony A9F (AF9) OLED and Z9F (ZF9) LCD along with answers to some of the reader questions. Initially, we must emphasize that these types of TV shootouts arranged by the manufacturer can be a little misleading as they include competing models and tend to compare the TVs in their standard picture modes rather than fully calibrated. We should also emphasize that we were unfortunately not allowed to take photos during the actual sessions so the photos included here are from the open floors. Focusing initially on Z9F (LCD), we are looking at a full array local dimming VA-type LCD panel with an unannounced number of dimming zones. 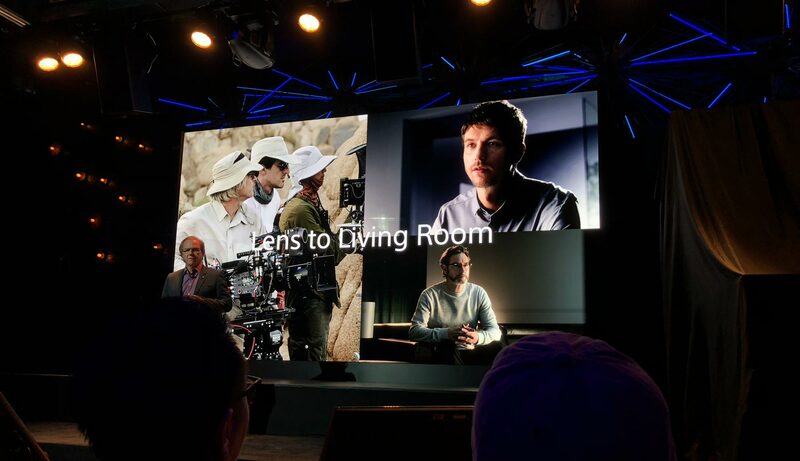 Sony had set up a TV shootout between Z9F and Samsung Q9FN (in Movie mode) along with the Sony X300 reference monitor that is often used in film studios. Comparing the two sets side-by-side revealed that Z9F in general better matched the color tones and HDR highlight reproduction of the reference, and as such the director’s intent. As mentioned, this is not entirely fair since the reference is in the room and Sony has had free reign to create a picture mode that matches the reference, which is the message that they are trying to convey. Still, Z9F performed better in this test, including in areas such as color gradients and especially in skin tones. One discipline in which Z9F showed some weakness was in the black Cinemascope bars on top and bottom that appeared lighter grey than on Samsung Q9FN. 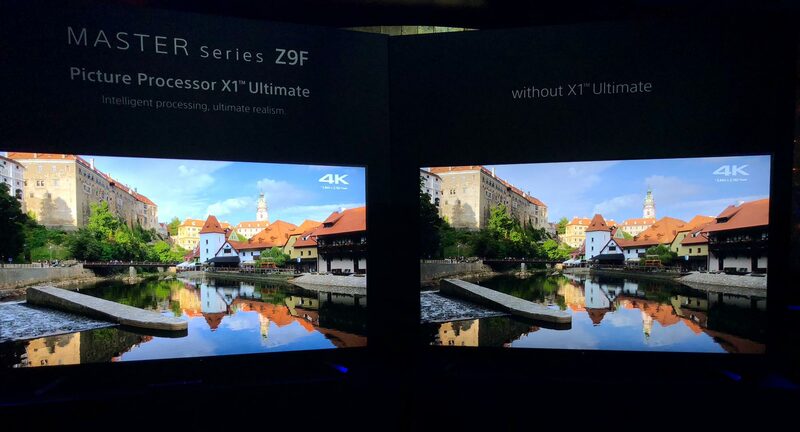 The zone response when dynamically increasing and decreasing backlight on the other hand was more accurate on Z9F than on Q9FN as Samsung’s TV suffers from some delay. It was not possible to evaluate other backlight characteristics (number of zones and peak brightness) during this demonstration. Sony has made an effort to improve viewing angles on Z9F, and the end result is convincing. Compared to Samsung Q9FN as well as Sony’s former X94E, the improvement was significant. Color saturation and accuracy does not suffer to the same extent as before when viewed off-axis. We cannot comment on off-axis black level performance before we get our hands on the TV. 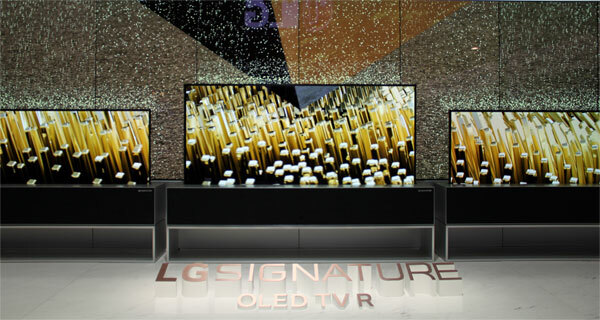 Switching our attention to A9F (OLED), Sony was comparing it to the LG E8 (OLED). Both TVs were in their respective Custom/Movie picture modes. During this demo, the trend was similar, although LG E8 was clearly closer (than Samsung Q9FN) to the reference monitor this time. The E8 suffered from a minor colorcast in its Cinema mode but it is unfortunate that Sony had refrained from using the auto-calibration feature on both sets to level the playing field in order for us to truly compare the TVs and evaluate them based on their full potential. Again, A9F appeared to reproduce more accurate skin tones as well as near-black details than LG E8. 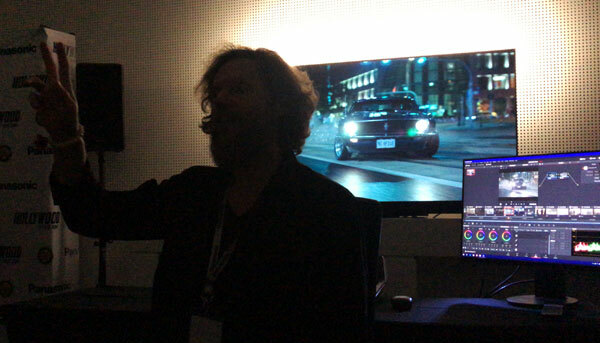 A9F uses the same panel as found in LG E8 – and Sony A8F – so differences in picture quality can be attributed to the new video processor and the factory-calibration. We also had a chance to hear the improved speaker system in A9F that builds on Sony’s work in the existing A1 and A8F OLED models. First of all, Sony has equipped the new TV with a 3.2 channel system, an upgrade from the 2.1 system in previous models. This specifically means that Sony has added a center channel and an extra subwoofer. Sony explained that the subwoofer now fires to each side rather than into the back wall, and that it is more powerful. By adding an extra speaker channel in the center of the display panel, human voices sound even more direct – as if they are actually coming from the person talking on-screen. Typically, it is possible to determine that voices are coming from somewhere outside of the TV (for example with a soundbar). 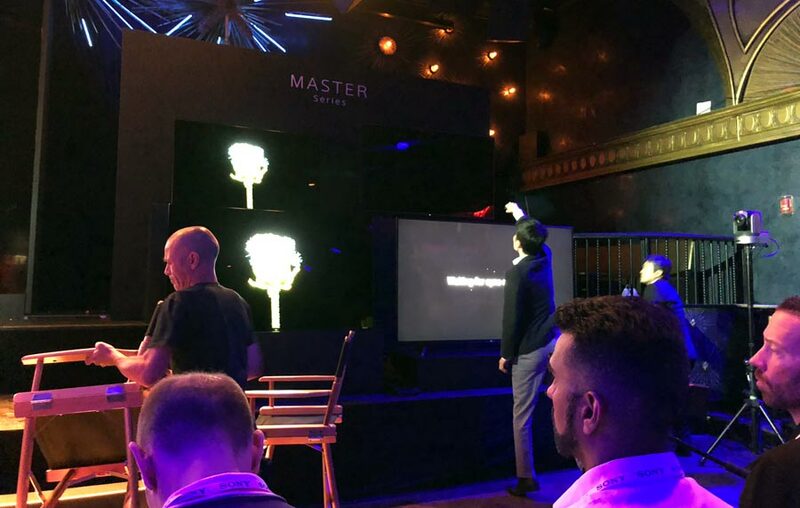 Sony explains that it has improved the actuators that are glued to the back of the panel and that it has furthermore made it possible to use all of the units as a center speaker in a full surround setup. To do that, you connect the actual TV to your surround system via traditional speaker terminals. You do not drive the speaker units in A9F from your receiver – it would risk affecting the lifespan of the actuators – so audio volume is regulated via the TV’s DSP and the built-in amplifier, based on input from the connected surround receiver. This means that, in theory, you could hit a ceiling for audio volume on A9F before hitting it on the other speakers in your surround setup. During this test, Sony demonstrated A9F’s standalone performance as well as the effect of letting A9F act as a center channel. Especially the latter setup sounded great. The Acoustic Surface+ speakers still tend to sound a little shrill and they lack something in mid-tones but when paired with a surround system, you get the benefit on having sound emanate directly from the “canvas”. The company carried out a number of A/B tests in which setups with a dedicated center speaker were compared to A9F, and it is clear that sound seems better positioned relative to the image when it comes directly from the display panel. Whether that is enough to convince enthusiasts who have invested in a full surround system probably depends on which price range we are talking about. 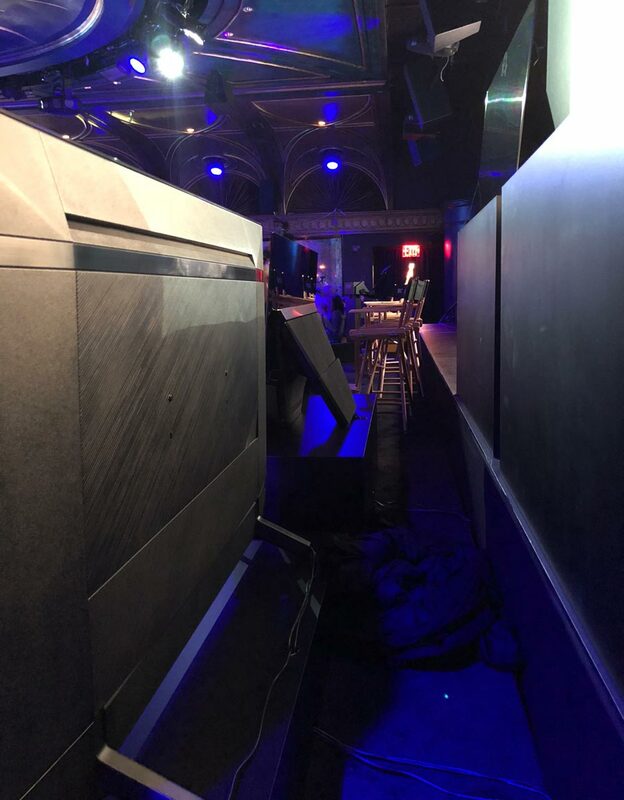 Sony did not talk about or demonstrate the speakers in Z9F. Auto-calibration on both Z9F and A9F works, like LG and Samsung, by using a dedicated Sony workflow in the CalMAN program. Besides the software you need a sensor that takes measurements on the display and a signal generator. However, the latter is in Sony’s case available as an app for Android TV, which is in stark contrast to the other manufacturers. Normally, you would need to invest in a costly ($1500+) standalone signal generation. The connection between TV and software can be set up either via a local network or LAN-to-LAN directly between PC and TV. 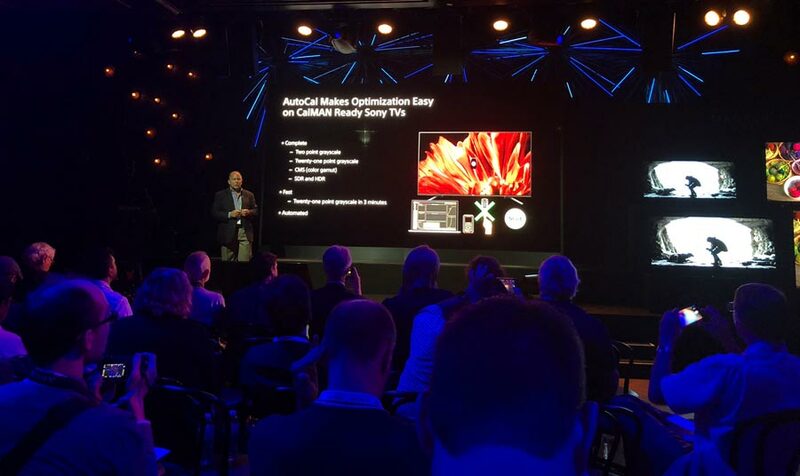 CalMAN’s AutoCal feature in Sony’s Master TVs is a software implementation as opposed to the hardware implementation in LG’s latest TVs. This basically means that CalMAN has access to the same picture setting options in the menus as you have as a user. This is not as fundamental a calibration as on LG’s TV but the advantage is that you can recreate the calibrated results if you for some reason need to reset the TV. 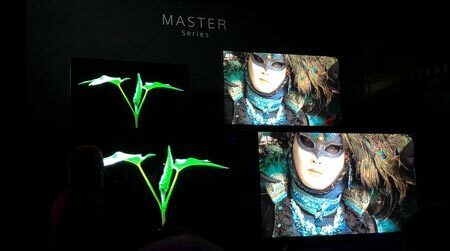 A new calibration option introduced on Sony’s Master TVs is CMS (Color Management System), which AutoCal can also access. The process of adjusting grey tones and primary/secondary colors takes only a few minutes without the user having to do anything. A significant advantage in this regard is that you can avoid having the on-screen menu interfere with your measurements, which is especially useful on an OLED TV. Manually calibrating any TV always requires you to jump in and out of menus. Sony has shaken up a few things following AutoCal implementation. The only picture modes that are available for AutoCal are Professional 1 and 2 that have been renamed to ‘Custom’. In other words; it is not possible to auto-calibrate Movie mode. The results are, at first glance, just as convincing as any we have seen in the past but traditionally it has been risky to adjust the lowest levels of grey tones as it can lead to posterization artefacts, so we will reserve judgment for when we have had a chance to properly test the feature in a controlled environment. We must also emphasize that AutoCal and the announced ‘Netflix Calibrated Mode’ are two separate settings and features. Netflix’s is a feature that is available only inside the built-in Netflix app. It is designed to deliver pictures as the content creator at Netflix intended when he/she mastered the content, meaning faithfully and accurately. It has been implemented as an extra feature but not as a picture mode like Movie or Custom. Rather it is a setting option that you can flip on and off when using the Netflix app. It seems like a somewhat clumsy way to integrate it rather than just offering an additional picture mode but it covers more than gamma/PQ and color settings so it may have been necessary to pull it out as a top-level setting. During the event we received lots of user questions that we conveyed to Sony for further explanation. Some of the answers are included below. 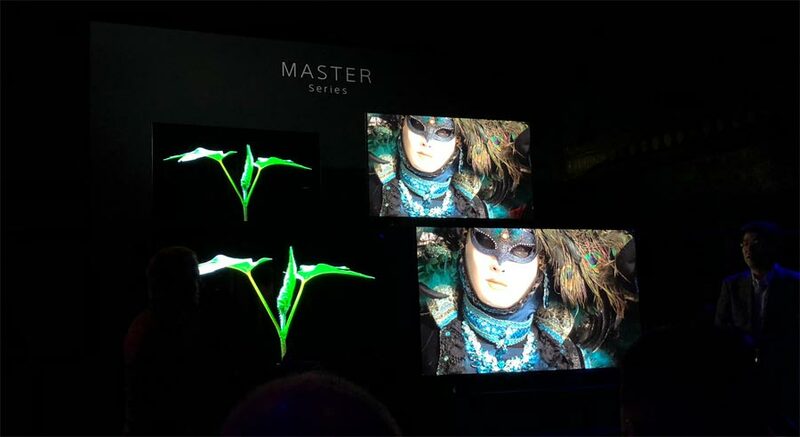 Will the new Master Series TVs offer eARC, VRR, HFR or other HDMI 2.1 features? Are there any improvements to input lag? Sony never comments or publishes such specific details so they declined to give a straight answer but any improvement in the area will be small. How many dimming zones in Z9F and which type of LCD panels is it using? What level of peak brightness and black level can we expect? Again, Sony declined to share such specific details but the zone count probably amounts up to a number somewhere between what was used in X94E and Z9D, although black levels left a little to be desired. What about Android? Which processor are the TVs equipped with and what software version? Has Sony anything to announce regarding Android Oreo on existing TVs? We were not able to confirm the model number of the SoC used but it is a new chip than the one found in X90F and A8F. The Master Series TVs are currently the only one that come pre-installed with Android Oreo. At this time, Sony had nothing to announce regarding the roll-out of Oreo on existing TVs. 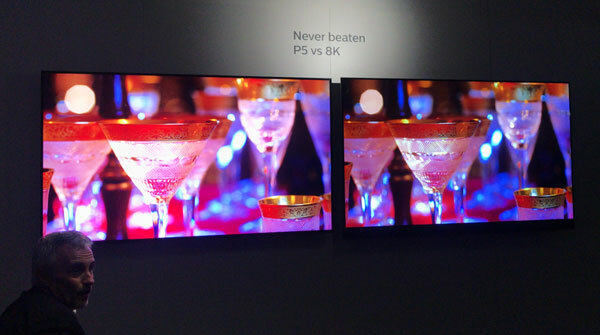 Will Sony release a 77-inch version of A9F? Are there any plans to upgrade the remote control? No. Same remote control as the one for A8F. When can we expect a Sony Atmos soundbar solution with rear speakers (or rear speakers for ST-5000)?